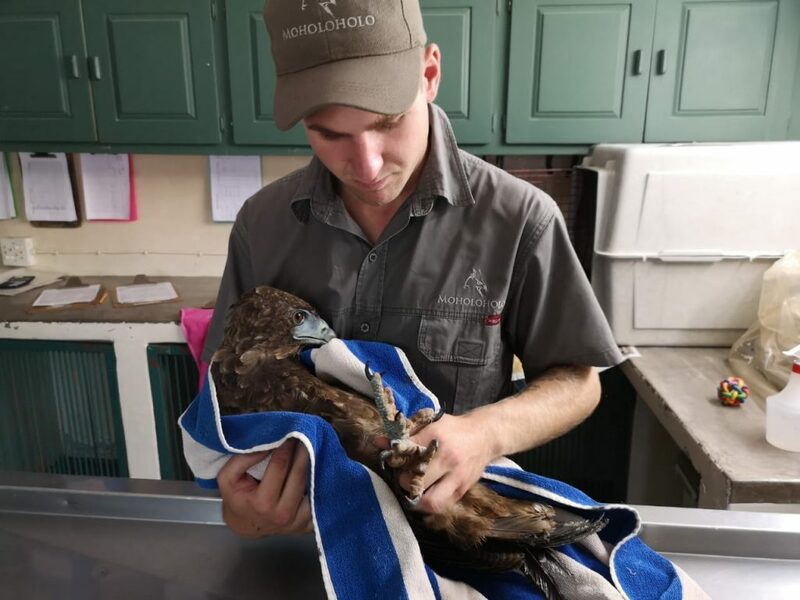 A young Bateleur is the newest patient to Moholoholo clinic. He was suspected to be poisoned however it became apparent that upon arrival that he was weak and starved. It is unknown how the youngster came to end up on the ground, but sadly it meant that mum and dad would not feed him now that he wasn’t on the nest. This led to the young raptor becoming emaciated and lethargic. He was tubed with fluid for the first 5 hours in order to rehydrate him, soon after we fed him very soft chicken meat which is easily digestible so he doesn’t use up the little energy he had on breaking down tough meat. After a few days of being fed on the soft meat his energy level was boosted and he picked up a generous amount of weight. He has also begun to eat on his own, usually when we have raptors or large eagles in the clinic, they are very proud birds and therefor very rarely eat on their own so this is good news. Bateleurs are considered ‘near threatened ‘on the iucn red list as their populations are declining. The main reason for this is habitat loss caused by humans increasing needs…such as agriculture and mining. Fun fact: They can travel up to 400km a day and glide for about 90% of flight time.